A method for the determination of underivatized amino acids based on capillary electrophoresis-mass spectrometry is described. To analyze free amino acids simultaneously, a low acidic pH electrolyte was used to confer positive charge on whole amino acids. All protonated amino acids migrated toward the cathode in CE and then were detected by electrospray ionization mass spectrometry with high selectivity and sensitivity. 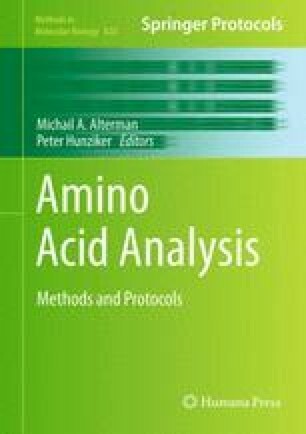 This method is simple, rapid, and selective and could be readily applied to the analysis of free amino acids in various samples.